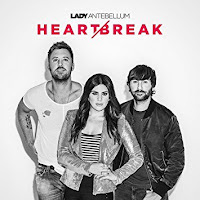 June 9th's release of Lady Antebellum's seventh studio album Heart Break showcases a group that clearly feels at home within country-pop. Holding less of a 'rootsy' sound than some previous releases, Heart Break is a strong selection of tracks however lacks the heartfelt emotion needed to really connect with the listener that has been present in previous songs such as Hello World and Golden. Lead single You Look Good is, in my opinion, the wrong choice to showcase the album. As a song in it's entirety it has grown on me but it feels like a little bit of a filler track compared with others on the album. It's upbeat, party style production lends itself to listeners playing it loud and singing along and in that way it's a competent track but it doesn't feel like the trio are entirely comfortable with the arrangement which ultimately takes off any real shine from the song. It'll certainly be interesting to see what the next single will be, in my opinion there are many tracks on the album stronger than You Look Good. The bittersweet nature of Famous is, in principal, a strong idea however the track fails to really connect, ultimately feeling a little forgettable. The track would have arguably benefited from a deeper production line - the main lead coming from a repeated guitar and piano hook - and I would have been interested to hear the dynamic that would have come from Charles and Hillary trading lead vocals rather than having Hillary sing the lead through the whole track. There are appealing aspects behind the individual parts of the track however it ultimately falls short of where it could be, possibly due in part to it's position as album closer. Undoubtedly the vast majority of listeners will be tapping their feet along to the infectious beat of Think About You within seconds of the track starting. Lyrically the overall message is nothing new however the track is delivered with a gutsy, attitude vocal and grounded by catchy production line. Think About You balances out a fully rounded production whilst still leaving the vocals as the focus throughout a track that I'm sure will have many listeners returning again and again. The strongest track on the release is without a doubt Army. Whilst Hillary and Charles regularly trade lead vocals throughout songs, Army is one of the few tracks on the album where Hillary's role becomes more of backing vocals and supporting Charles' lead. The grittiness of his tone undoubtedly suits the track and adds an appealing edge to it alongside a solid drum line and re-occurring electric guitar hook.. Lyrically Army tells an emotive tale that is sure to be relatable in many different circumstances, a distinctly listenable track that deserves to be highlighted. As a fan of Lady Antebellum's 'rootsier' side, Heart Break isn't a return to their best but it is still a strong album and I would urge perspective listeners to not write it off as simply country-pop without first listening as I am sure most people will find something here that will appeal to them. Whilst Heart Break is ultimately a generally appealing album, I would however personally say Charles' solo release remains the strongest recent release linked to the trio. Labels: Lady Antebellum "Heart Break"